Word Work is one of my favorites... now!! I have to say... when I began word work last year, I had 6 boxes full of pom-poms, stamps and stamp pad, wiki sticks, foam letters etc. The kids LOVED it, but after a bit, it became more of a play station than work station. Even though the intention was to study spelling and word work... I felt like my 2nd graders needed/should be expected to do more ;( (mean teacher). Each student has a small journal in their book box for WORD WORK. 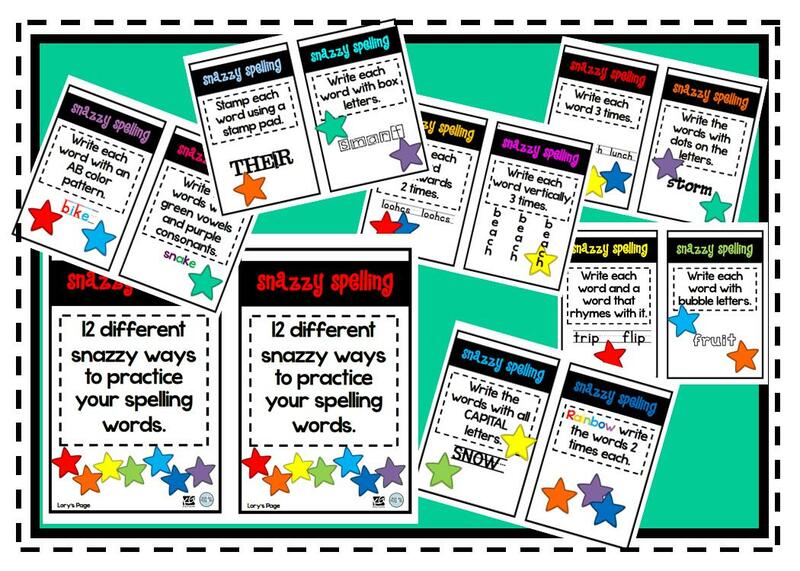 I created 6 Snazzy Spelling booklets for the students to share. During that specific rotation... they write the date and choose the activity they want to complete using their spelling words... posted on the wall up front. They feel a bit more accountable for their work and tend to show better work. 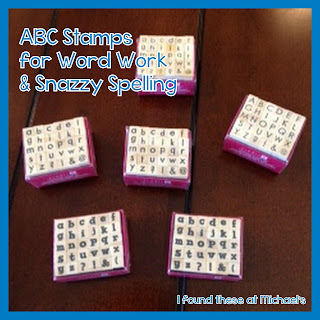 One of the specific cards tells the kids to stamp their spelling words... so I do have a small stamp set and ink pad in the little Snazzy Spelling box in case they do this activity. Last week while I was at Michaels I found these tiny sets for about $2-$3. 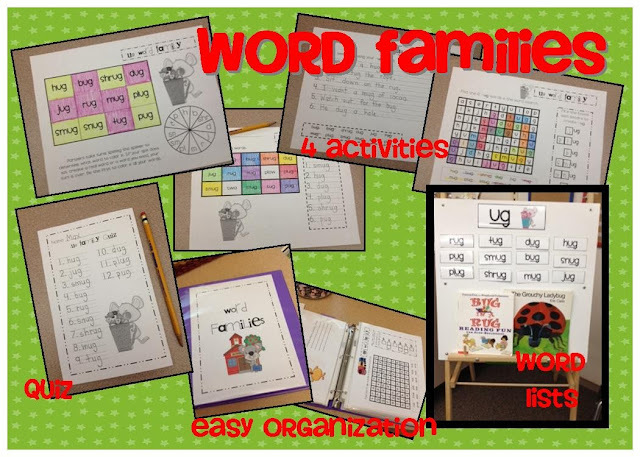 Each week we also cover a specific word family in class. The bottom picture with The Grouchy Ladybug is what the easel looks like all year (with the exception of different words and books). During one of the regrouping periods, after recognizing good things that happened during the Daily 5 rotation and something we could improve on... we read a literature book that fits the word family and review the words. Sometimes the kids choose to use these words during their Word Work. They still choose an activity from the Snazzy Spelling book but use these words instead. 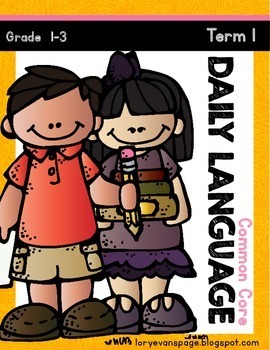 ABC order, Syllables, Nouns, Verbs, Adjectives, Antonyms, Synonyms, Contractions, Compound Words, Plurals, Prefix and Suffix. 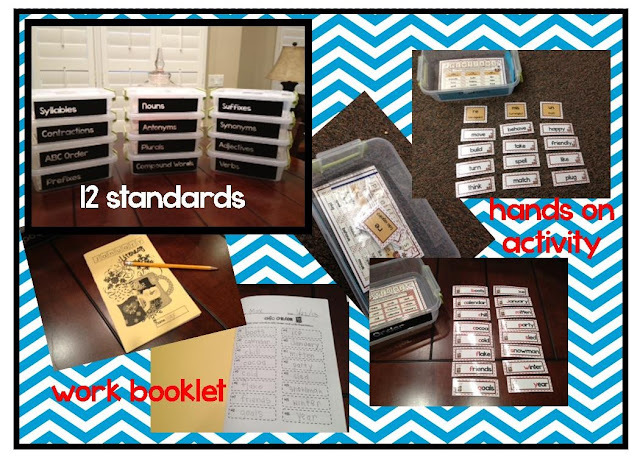 By January, they were able to choose 1 of the boxes above and complete the hands on activity and independent assignment (in the booklet) during Word Work on their own. This year, I am going to start with the activity, written assignment in September... however, we will do them together as a class. I made the pieces at bit larger and put a magnet on the back to move them around on the white board in the Daily 5 area. I'm excited to see if this helps with the concepts even more. I'd love to hear how you use your Word Work time. Have a fabulous summer week!!! 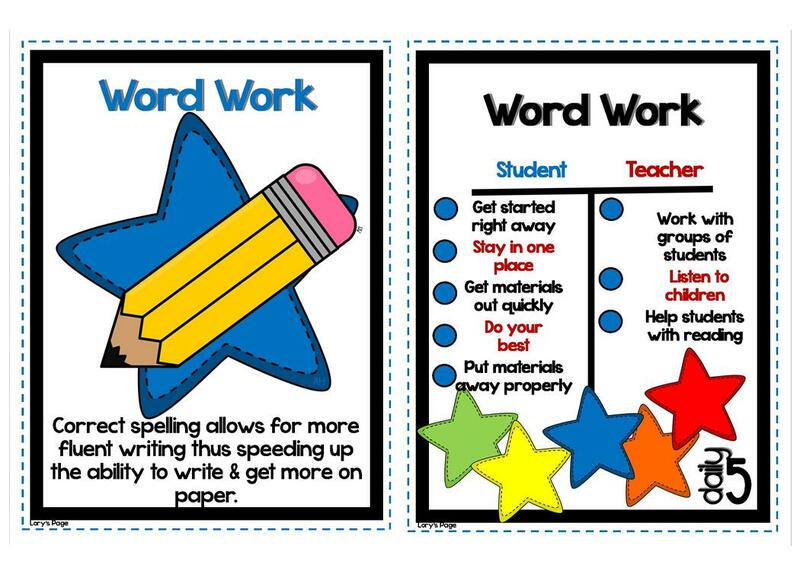 I usually do word work with my first graders during reading groups and I also have at least one word work center set up for the entire class. Thanks for sharing your Word Work ideas! I sometimes worried that my kiddos would turn it into a playtime, too. I had a printed sheet each week that the kiddos would get on Monday and had to turn into me before the spelling test on Friday. This really worked well as far as keeping them accountable! They got a participation grade for the percentage complete on their sheet, too. 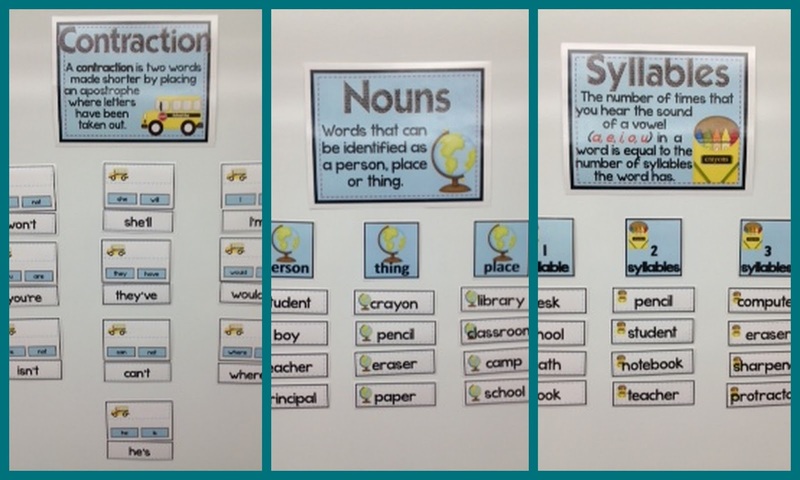 My favorite thing for word work is using word sorts. Love, love, love your ideas! I like the variety in your choices. I struggled with Words Work in D5 and took it out as a choice last year because I felt the kids needed more accountability and direct instruction. Your post gives me some ideas to think about. Thank you! I am switching schools and grade levels, going from kindergarten to second grade. As I await the chance to work on my room, I am spending a lot of time exploring pinterest and teaching blogs. The last time I taught second grade was 1999-2000, when teaching reading was whole language in our school corporation. I look forward to exploring second grade curriculum and using what I have learned to grow as an educator. Thank you for all of your great blog posts helping me along my way! 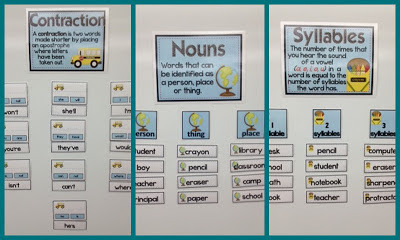 I used your March and April word work choices with my kids last year. They loved them and always asked when they could do them! I loved that they got some great practice with those skills and I absolutely love your booklet for recording their work. 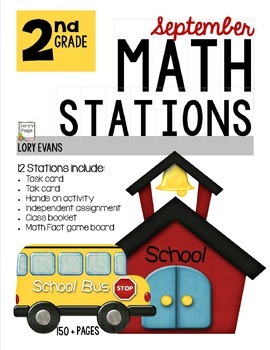 I just bought your SEPT. literacy stations the other day so that I can start the year with them. Thank you!! 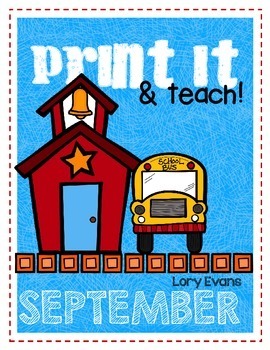 Also do you have examples of all these activities on your blog or at TPT? 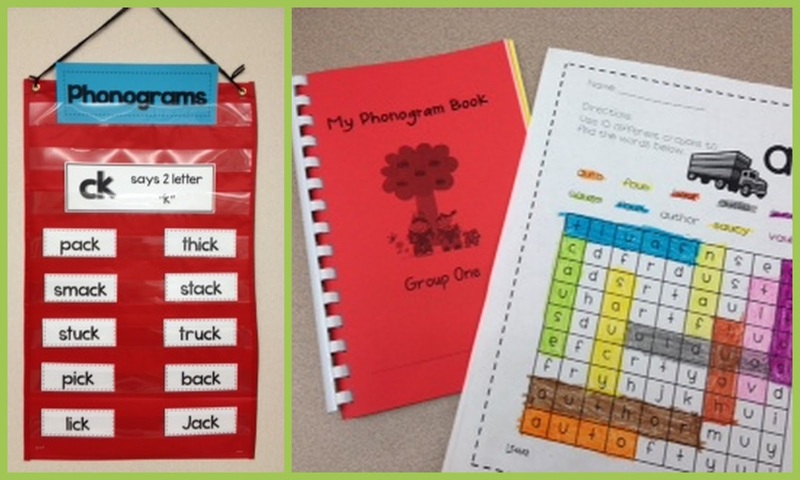 Sometimes I have a few other activities- compound words, syllables, etc. but my goal is for the kids to practice the phonics skill for the week/spelling words. We tell them/their families to practice their word each evening at home but don't require them to turn anything in. For some of my students, I know their only practice with the words is at school since they are somewhat over scheduled in the evenings. I include parts of speech practice with the weekly work on writing activities, but have always wondered where they fit (Word Work or Work on Writing). I love your Snazzy Spelling Booklets! What a good idea! I've always admired your organization with the other activities too (in the bins) and have had them pinned for some time! Thanks for sharing all your ideas!! It's so helpful! Thanks for sharing all of these great ideas! I will actually be a first year teacher this school year, so I do not have many ideas...YET. However, I really like how these activities dig deeper into the word work portion of Daily 5. I was also concerned that my students would see Word Work as possible play time. I really wanted the center to have some "meat" to it, and now I know that it will. Thank you! I also forgot my email. Sorry! Something easy that my kids love is writing spelling words on laminated "ipads" I found on pinterest. I always need new ideas for word work, so thank you for this! Thank you for sharing your ideas!! 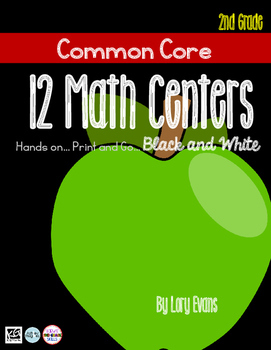 This will be my second year teaching second grade and I want to change the way I did centers from last year. You have given me some great ideas to try! We also do stamping, letter tiles, etc. Something I really like is that I took old keyboards, cut off the cords, then painted over them so kids use them to type their words! They love that one. I really like how you incorporate antonyms, synonyms, etc into your word work block. I definitely want to do that next year! Super excited to pin this and think more about how I can! :) Thanks for sharing!! I just started Daily 5 this year. 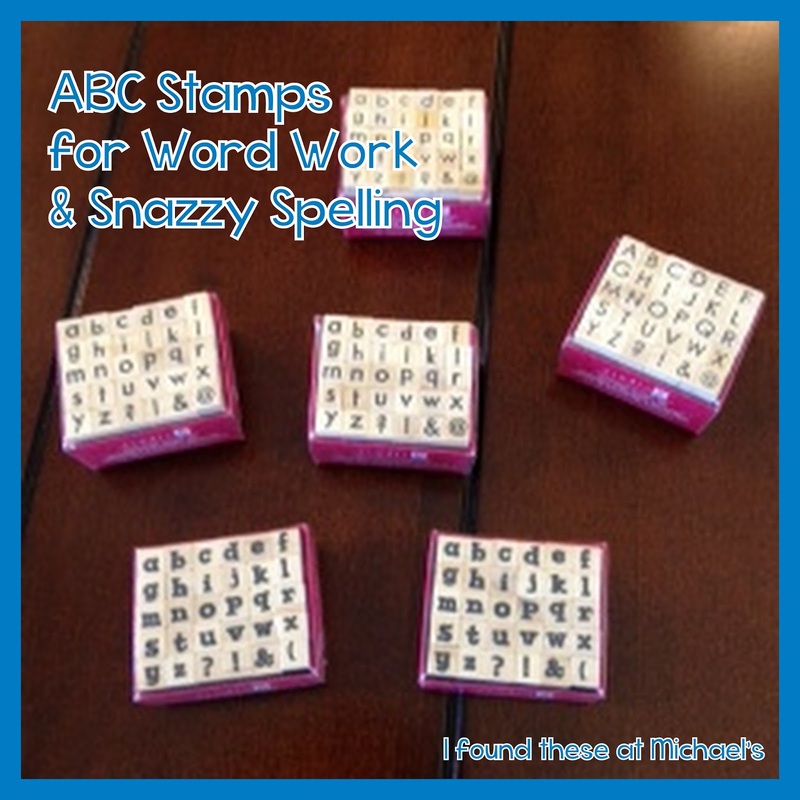 I also used letter tiles, stamps, various games to do during word work. I then discovered YOUR literacy stations and began using them in March. I loved them and so did my kiddos! They really loved the independence of doing the activities and I loved that word work was actually reinforcing important concepts rather than just practicing spelling words! Looks amazing!! I'm trying to beef up my word work station for next year and this would totally help! Thanks for the opportunity! Right now all I really do is spelling word practice (rainbow words, stamping words, wax sticks, magnet letters) and I hate it. I did buy some interactive tic-tac-toe whiteboard games from Lakeshore, which includes grammar, phonics, and vocab. I know I need to do more! You are one of those "Rock Star" teachers in my eyes! You have so many fabulous ideas and materials. I have bought so many of them and every single one is top quality. Thank you for sharing your ideas. I am so glad that you are doing the book study. 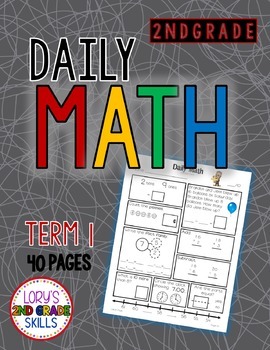 Although I have had the book for several years, I have never actually implemented D5 in my classroom. This year I had planned on working on my ELA materials and trying to get my centers in order so that I can start the year out with everything ready. 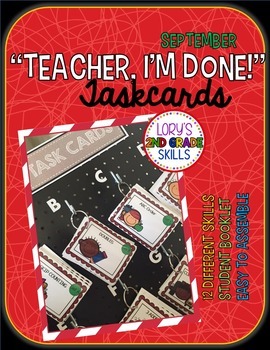 I had already been carefully looking over your Monthly Literacy Units and getting my wishlist together. Will you be using those in your centers with your D5 setup? That is what I have been thinking about doing. Again....thanks for sharing all of your ideas! Thank you for sharing what exactly your Word Work looks like. I'm totally stuck in the past...whole group daily spelling lesson. Sheesh! I'm SO embarrassed! You are inspiring me to branch out. Thanks for showing the tools/ideas I need to make a major transition. It seems doable and I'm super excited! Lory do you have a picture of your word wall? I am moving up from K to 2nd and I M trying to decide what to do with my WW. In K I had it under my white board the headers had a picture along with the letter. Thanks for sharing your ideas! I am loving your daily 5 blogs-that is something I want to work on a little better this year! My word centers are lacking but I rotate manipulatives/worksheets in and out that the students use to practice their words. 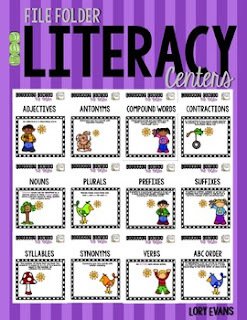 I also try and include some skill centers in there too (contractions, compound words etc...) Would love some FRESH ideas! Thanks for sharing these ideas. I have not attempted word work yet and can't wait to use your ideas. Thanks. Thanks for your comments friends. I've been playing with friends from out of town. I apologize for the tardiness. Winners will be posted within the next couple hours. Oh, these are great ideas!! I'm a little overwhelmed at the thought of moving from 5th grade to 2/3 next year, and your ideas are awesome! Coming from 5th grade my "word work" looked completely different, so I can't share much of value at this level. I used a great resource called "Big Words for Big Kids" for the past several years and saw great results. I'd LOVE to win a copy of any of these!! BTW... are these in your TpT store? I can't find links anywhere?! 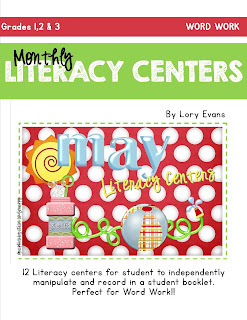 Entire Year of Literacy Centers Posted!!! !